Build An Awe-Inspiring V-Shape With This Lat And Shoulder Workout! If you don't possess the genetics for a killer v-shape, don't worry! With the right lat and shoulder workouts, you will build an awe-inspiring physique that will rival the pros! When you perform lat exercises, imagine your arms are an extension of the bar. I&apos;ve found that splitting wide grip lat pull-downs in half provides better results. With Side Lateral raises, do "partial repetitions" as it puts tension on the middle delts. Some guys possess really cool structural genetics for bodybuilding. They seem to have these shoulder clavicles that jut outward a foot on each side and a waistline that can shrink down to 28 inches on a simple diet. All they have to do are some military presses, some sloppy lat pull-downs, and get their body fat below ten percent and they&apos;ve got a killer V-shape. Huh - must be nice. As you might have guessed, I&apos;m not one of those guys. My shoulders started out with average width and my waist-level internal organs seem to be of the extra-large variety. I know - that&apos;s a little more information than you needed. "Why is he talking about his internal organs?" you might be asking. What I&apos;m trying to say is that even when my body fat is well below ten percent, I still don&apos;t possess a super-small waistline. It&apos;s a genetic thing. This means I&apos;ve had a particularly challenging time creating a V-shaped body. With a genetically large waistline even while holding a body fat level low enough to show abdominals, I have to work extra hard at widening my shoulders and lats to create a &apos;V&apos; illusion. But I&apos;m getting more V-like all the time. And I attribute this progress to some simple techniques that you can add to your shoulder and lat routines for the same effect. If you happen to be blessed with a waistline that would make a female supermodel green with envy and shoulder clavicles as wide as a door, then following these tips will enhance the gifts that nature has given you. Are You Happy With Your Shoulders? I&apos;ve actually been complimented many times for my lats. They&apos;re well developed, even if they don&apos;t appear so at first glance because of my strangely "un-shrinkable" waist area. I attribute much of my nice lat development to advice from an article I read way back in 1988 by the legendary bodybuilder, Rich Gaspari. I perused that article several times, really taking to heart the seemingly unorthodox tips that he dispensed. What were the tips? Here&apos;s the gist of it since I have to paraphrase in the absence of that old Muscle and Fitness Magazine article. Mr. Gaspari said that when you perform lat exercises, imagine your arms are only an extension of the bar you&apos;re holding. In other words, quit using momentum and stop using your biceps to pull the weight down or toward you. A real lat workout requires slow and concentrated movement. If you think of your arms only as pieces of equipment that are attaching your lats to the weight stack, you will pull slowly from your back. If you then squeeze your shoulder blades together at the peak of the movement, you just might feel your lat muscles really working for the first time. Using the technique described above, it&apos;s imperative that you perform just enough exercise to stimulate upper back growth and don&apos;t over train. Personally, I only do four exercises for my lats. Let me tell you; they&apos;ve been growing like crazy from those four movements. I&apos;ve found that if the lats are worked with intense concentration from each major angle, exercise redundancy usually results in over training and lack of progress. Really Working For The First Time. I&apos;m sure you&apos;ve noticed the "top half/bottom half" designations on lat pull-downs and are wondering what I mean by that. I&apos;ve found that splitting this particular exercise in half provides better results. On the top half exercise, I pull the bar until my upper arms are only about parallel with the floor. In other words; I just do the first half of a lat pull-down. Obviously, on exercise number four, I pull from the midway point to having the bar all the way to the top of my chest. If you split the movement into two exercises like this, you might find (as I do) that you can use a lot more weight for the "top half" pull downs that the "bottom half" ones. Close-grip pull-downs are also performed in a very specific manner. Contrary to how most people perform these, with their body upright through the entire motion, you should move your torso to a forty-five degree angle from the vertical position as you slowly bring the weight to your chest. Begin pulling the close-grip bar downward with a yanking motion that comes very deliberately from those huge muscles below your shoulder blades. As you bring the bar toward your sternum, keep thinking of your arms as merely extensions of the bar and pull strictly from your back. Imagine you could touch your shoulder blades together behind you as you lean back to a forty-five degree angle while bringing the bar to your chest. Moving the upper body backward to forty-five degrees during the movement like this will make the exercise into both a lat widening and thickening movement. Click Here For A Video Demonstration Of Close-Grip Front Lat Pulldown. Seated Pulley Rows should likewise be done very slowly and strictly. They should be done without using momentum and by squeezing the shoulder blades together after focusing on pulling slowly from the back - leaving the arms only as "attaching devices". 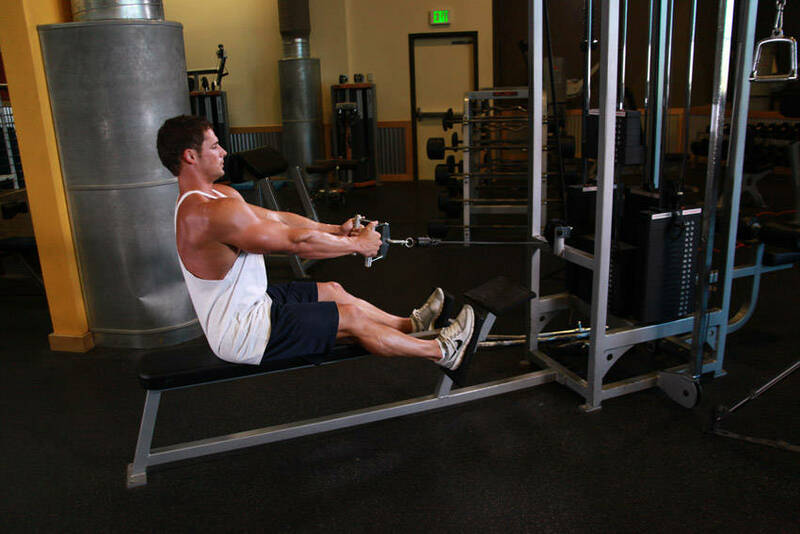 Click Here For A Video Demonstration Of Seated Cable Rows. I&apos;ve actually been doing every one of these exercises on machines and getting terrific results. Sometimes I switch to free weights, but I&apos;ve found that I can really plow forward with the heaviest weights possible for six reps using the safety element of Cybex machines. This has been especially so with the shoulder presses. 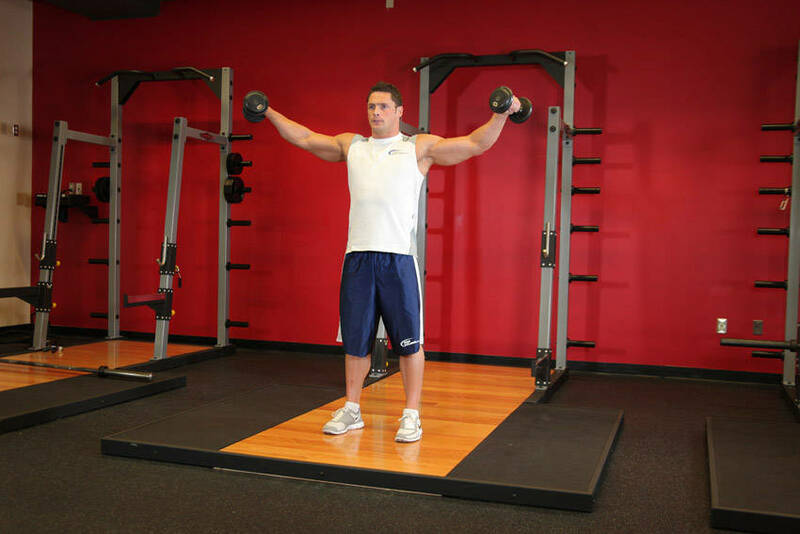 Click Here For A Video Demonstration Of Machine Shoulder (Military) Press. Doing front raises with a cable and single-hand bar puts continuous tension on the front deltoids - as opposed to dumbbells which decrease the tension as the weight is brought to shoulder level. Remember - never go above shoulder level on front or side lateral movements. On side laterals, I&apos;ve been getting the best results from reducing my range of motion to about half of what it used to be. I raise the weight until the handles are shoulder level, then I lower my arms until they&apos;re still about twelve inches from being at my sides. This turns the movement into "partial repetitions", but it puts incredible continuous tension on those middle delts where there&apos;s a lot of potential for building width. Click Here For A Video Demonstration Of Side Lateral Raise. My suggestion is to perform no more than six reps per set and do four to six sets per exercise. Push for higher volumes during each workout and don&apos;t work a body part more than once a week. Following this basic routine and advice, you can get that coveted "V-shape", even if, like me, you aren&apos;t working with the most ideal foundation for creating it. 8 Weeks To Monster Shoulders! If you want to look freaking huge, you must have a pair of shoulders that you can be proud of. It takes a lot of work, and you will be sore, but do this routine for six to eight weeks and you can build monster shoulders. Girls love them, guys envy them. You just can&apos;t go wrong with this great routine. The following six exercises are your path to the shoulders of Colossus! 5 Shoulder Workouts For Mass - A Beginner&apos;s Guide! Want to take your shoulders to the next level? Beginners can learn more and start building them with the following 5 shoulder workouts. Check it out!